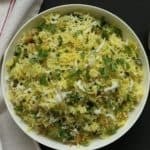 Cabbage Rice is a simple and tasty, vegan rice dish that is loaded with vitamins from cabbage and has just right heat from fresh ginger and green chilies. This is one of my mom’s newest recipe that I got to taste and learn when she visited me this summer. 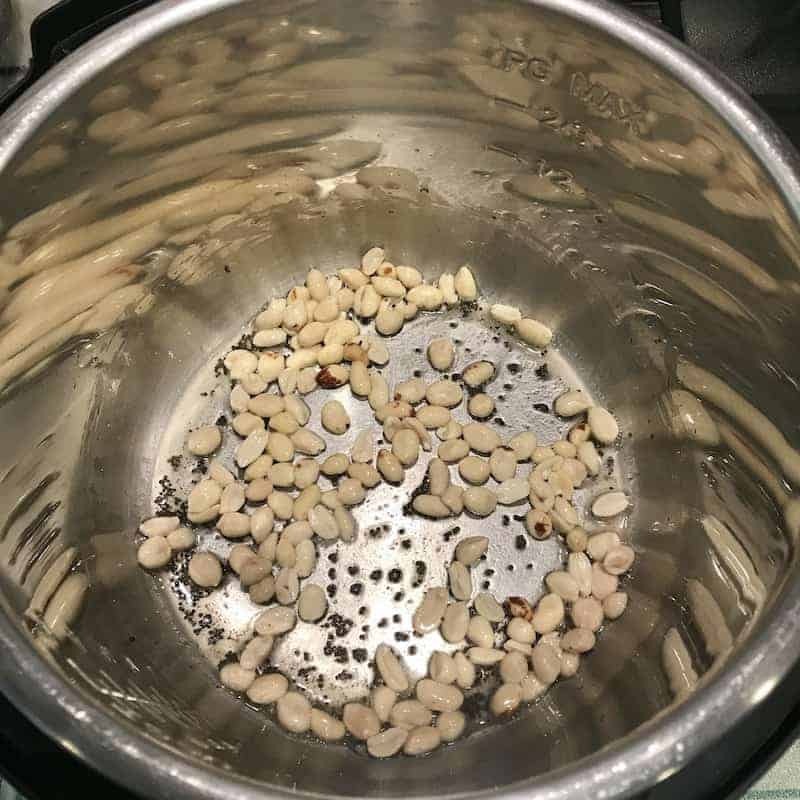 When she first made it on the stove-top, I was not sure if it would be a good recipe for Instant Pot. As, this recipe does not use a lot of water. The soaked rice is basically slow cooked with little water and then all the juices from shredded cabbage. It did take us a couple of tries to achieve this perfect Instant Pot recipe! We started with a whole head of cabbage bought fresh from the farmers market. After chopping it into smaller pieces, we grated them in the food processor. 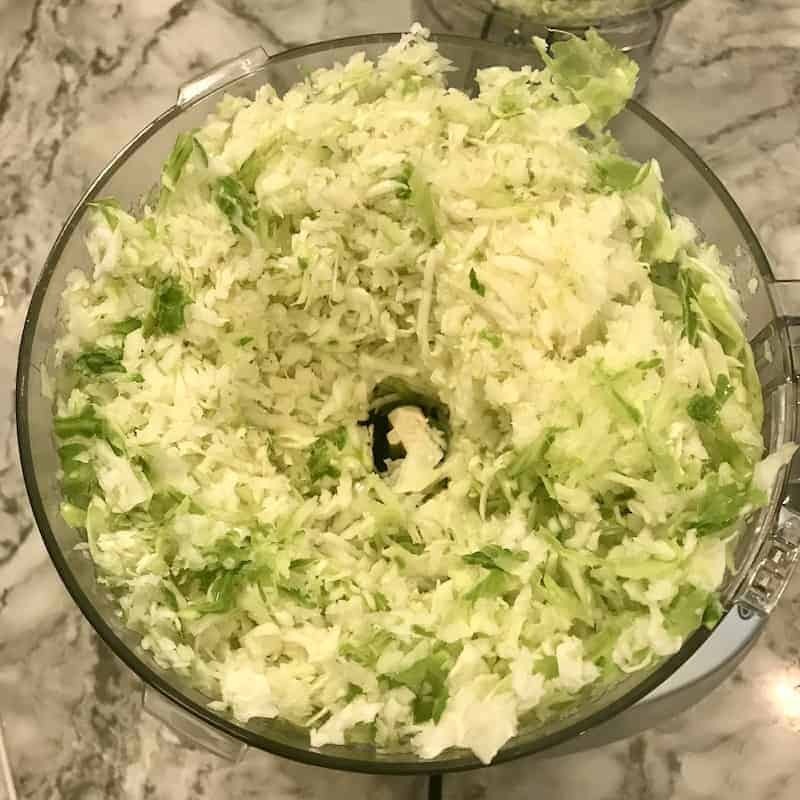 We had about eight heaping cups of cabbage that we used in this recipe! 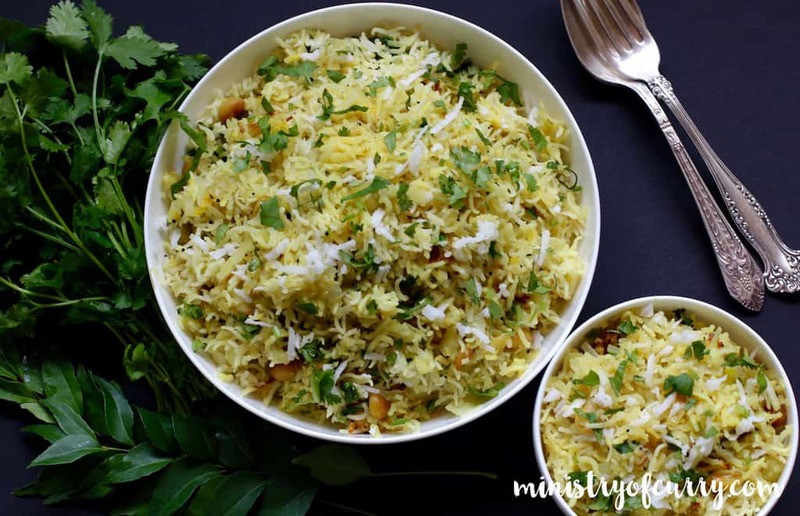 This recipe uses long grain Basmati rice and is cooked mostly in the water released from the cabbage. Rice button, which is a 12 minute low-pressure setting works perfectly for this recipe. And if there is some rice browned at the bottom, just scrape it and enjoy it. 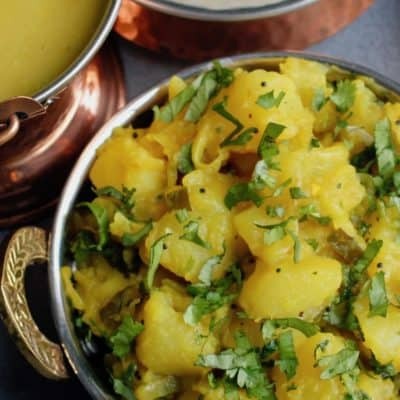 Here is a good article I recently came across that explains asafetida or hing used as an optional ingredient in this recipe! Rinse the rice 2-3 times and then soak the rice in 4 cups of warm water for 2 hours. Drain the rice and keep aside. Turn Instant Pot to Saute(more) mode and heat oil. Add asafetida, mustard seeds in the oil and allow the mustard seeds to pop. It may take 3 to 4 minutes for the mustard seeds to pop. Add peanuts and sauté for a minute. Add turmeric, curry leaves, ginger and green chili. Mix everything together and cook until peanuts are golden brown. 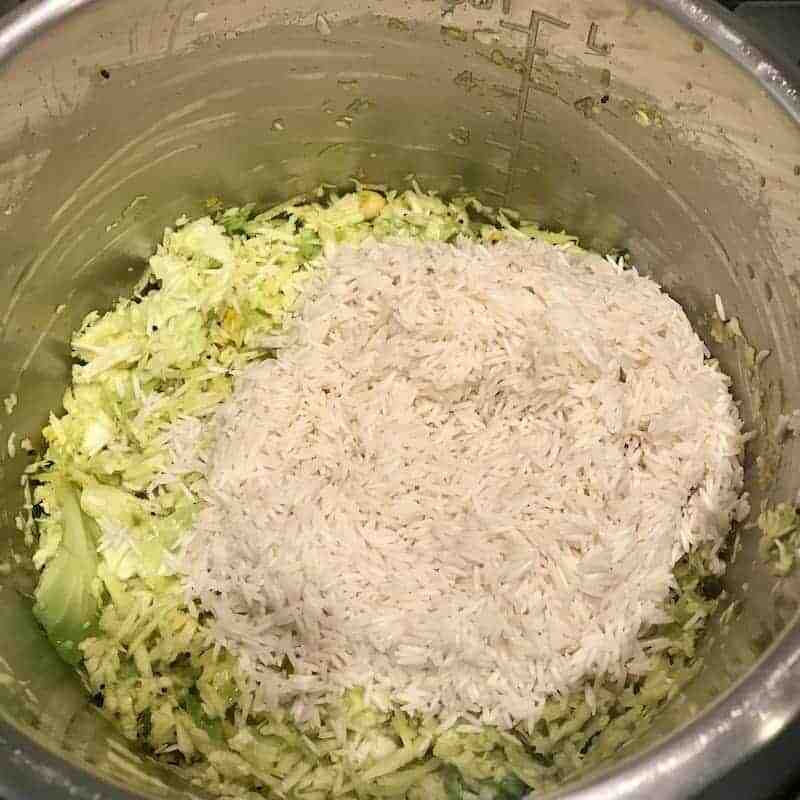 Add grated cabbage and salt. Mix again. Add drained rice and gently mix everything together. Add 2 cups of water. 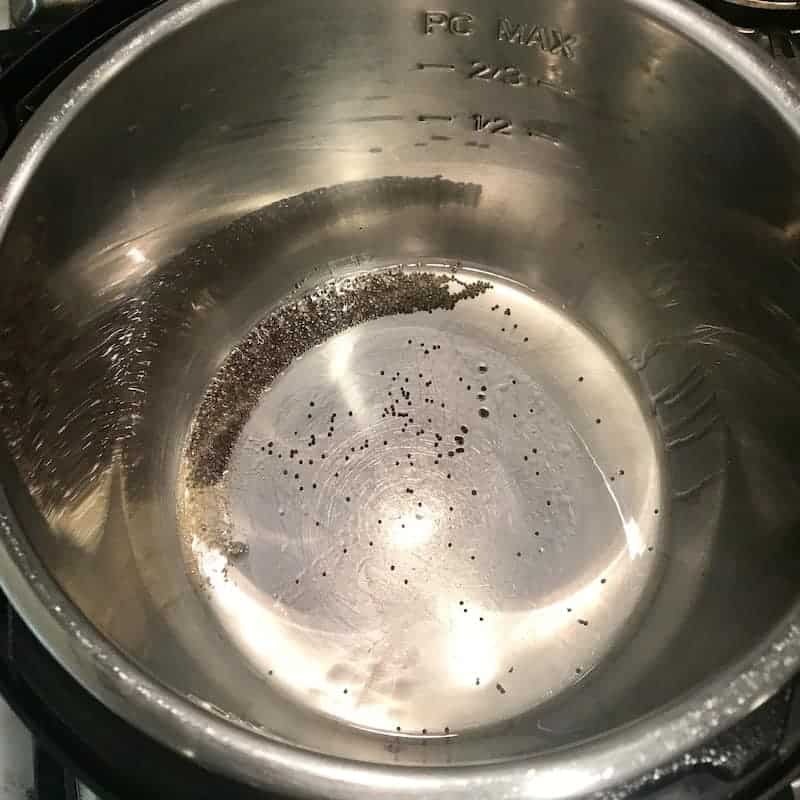 Close the Instant Pot lid with pressure valve to sealing. Press the ‘Rice’ button. Allow Natural Pressure Release. 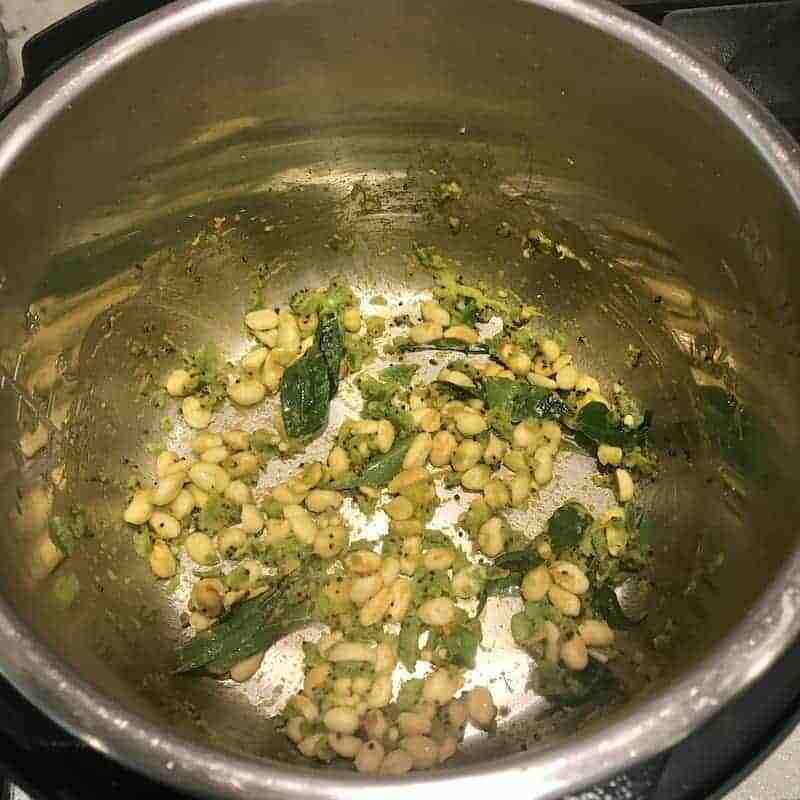 Open Instant Pot and add lemon juice. Garnish with cilantro and coconut. Rinse the rice 2-3 times and then soak the rice in 4 cups of warm water for 2 hours. Drain the rice and keep aside. 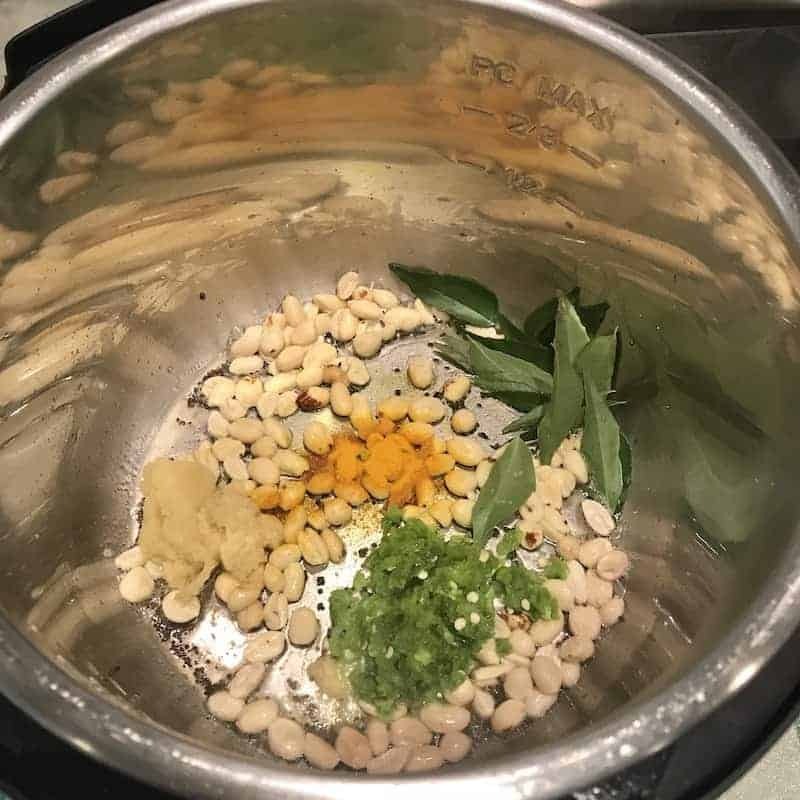 Turn Instant Pot to Saute(more) mode. Heat oil, add asafetida and mustard seeds and allow them to pop. This may take 3 to 4 minutes. Add peanuts and sauté for a minute. Add turmeric, curry leaves, ginger and green chili. Mix everything together and cook until peanuts are golden brown. Close Instant Pot lid with pressure valve to sealing. Press the ‘Rice’ button. Allow Natural Pressure Release. Open Instant Pot and pour lemon juice. 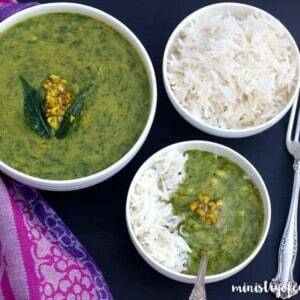 Garnish with cilantro and coconut. Enjoy hot! That sounds great!! Share your Pinterest board. I also have a Pinterest board for IP that you can join. 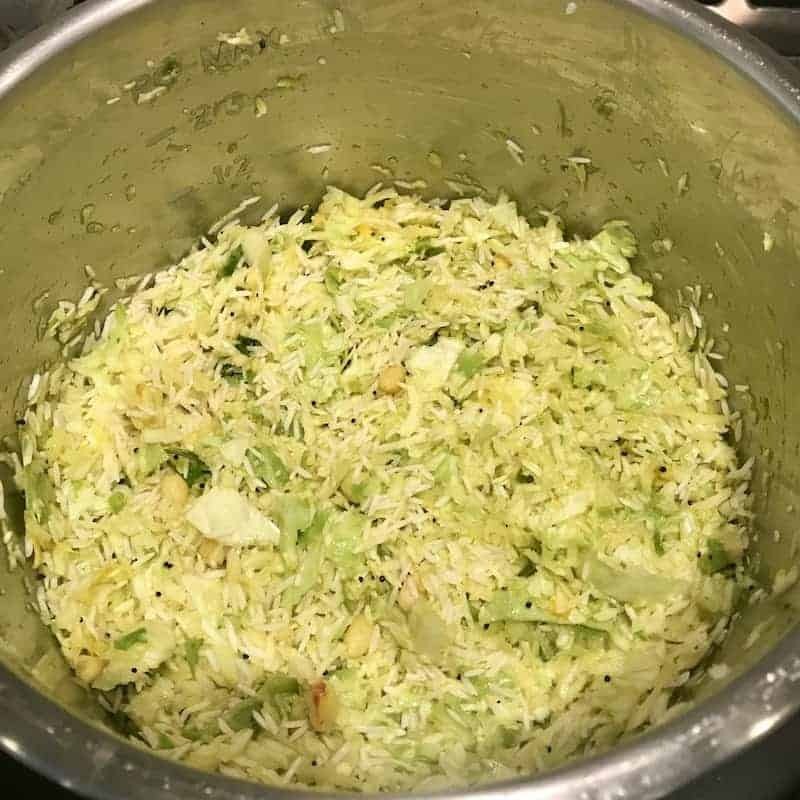 Cabbage rice looks so beautiful ! 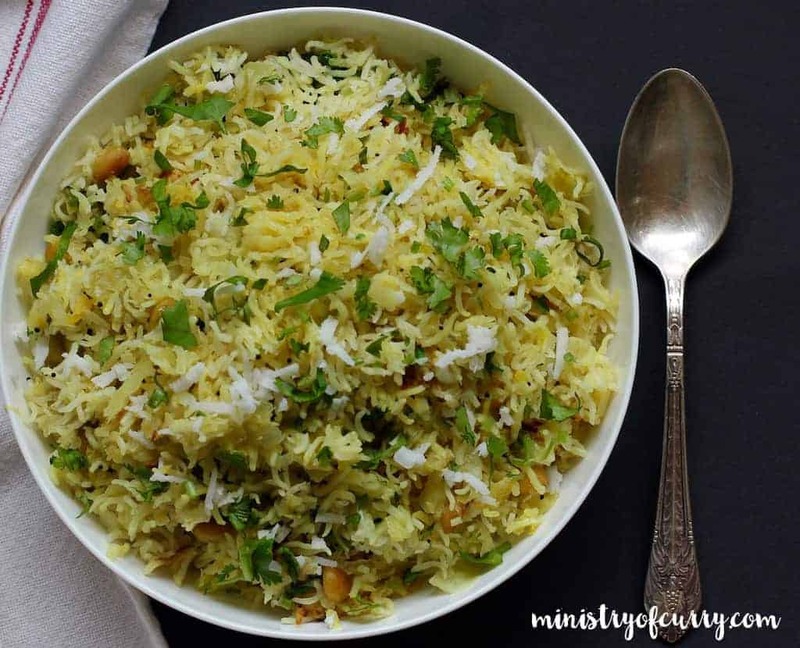 Archana – am I understanding that you need two cups of water added to the soaked rice along with the cabbage? That’s not too much? Hi Lisa, First you soak rinsed rice in 4 cups of water for 2 hours. Then you drain the water out completely. Later when you add rice to the dish, you add 2 cups of water for the rice to cook. Hope this is clear. This sounds wonderful! I’ve been looking for a good cabbage recipe for the IP. I’m looking forward to making this, but I have a question about the liquids. 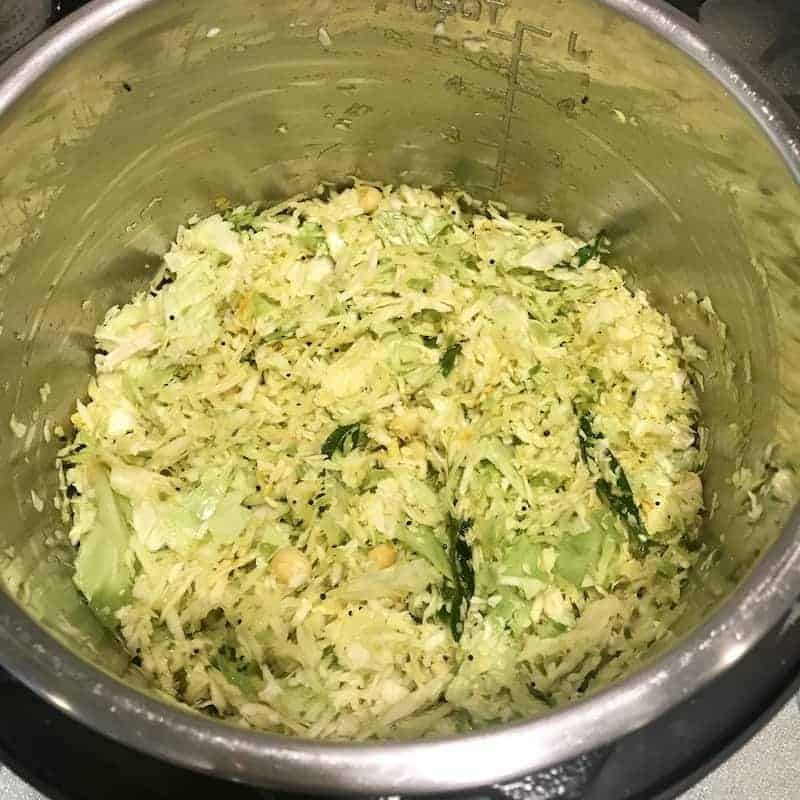 You mention that it cooks mostly in the liquid from the cabbage (yum! ), but in the recipe instructions, you mention adding two cups of water as well. Dry rice in the IP is usually cooked at a 1:1 ration, so is that not too much liquid then? The rice is already soaked, then cooked with an equal amount of water, PLUS all the liquid from the cabbage? Thank you! Hi Bella! 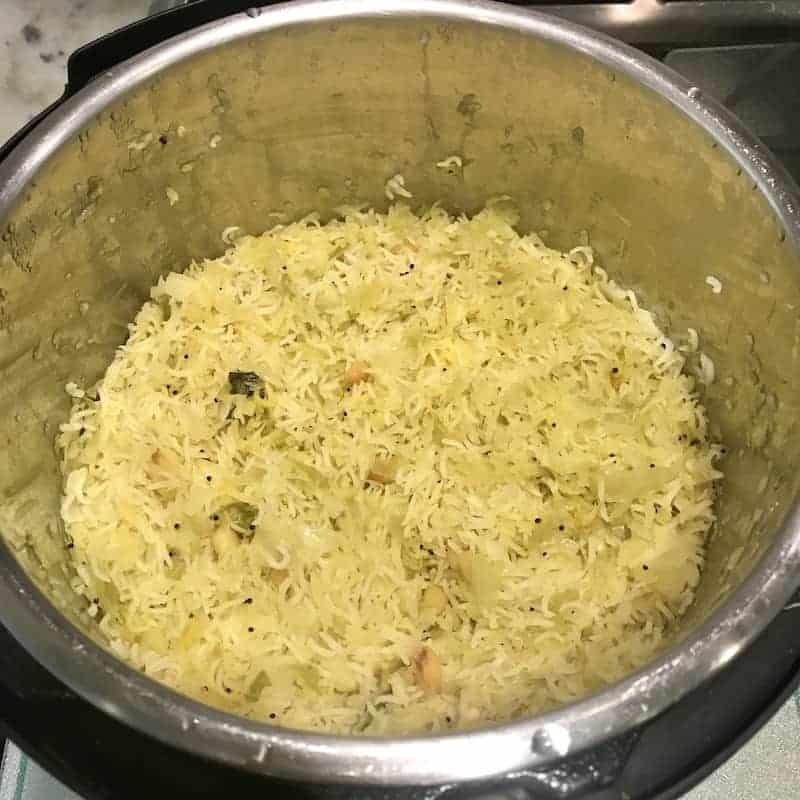 I am using long Basmati rice and It needs about 1:1.5 ratio to cook properly. So in this recipe we are reducing some of that water to account for the liquids from cabbage. If you are using Jasmine rice, the water ratio will be much less, but I have not tried this recipe with Jasmine rice. Wonderful, thank you! This is now on my menu plan for next week. This looks delicious Archana! 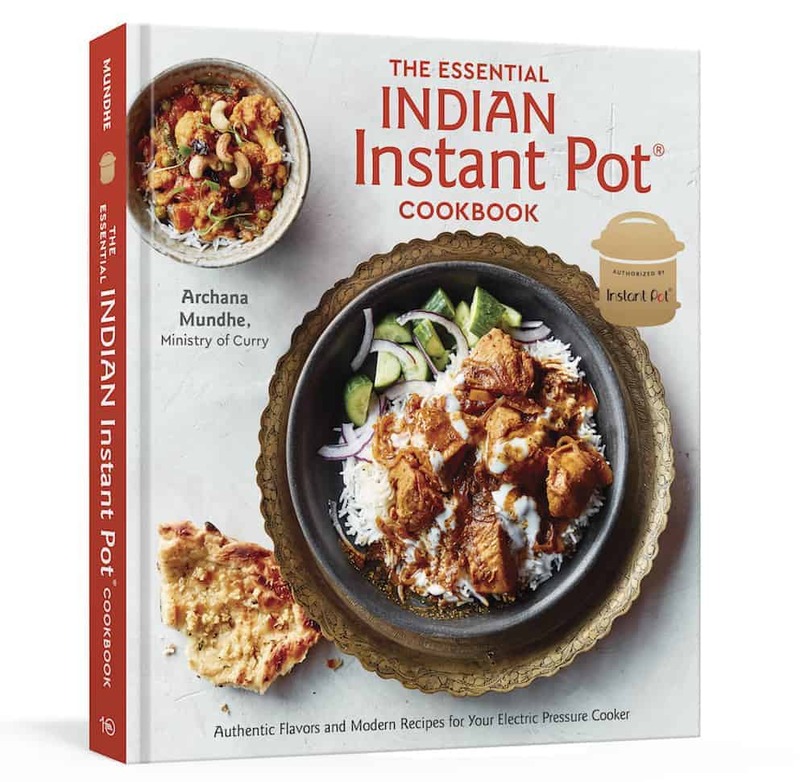 I need to get an Instant Pot! So happy to hear this! Thank you for letting me know! Hi Rhonda! So curry leaves are fresh herbs that are sold in Indian Grocery stores. If you do not find then you can just skip them for this recipe. Let me know if you have any questions. This turned out so TASTY! Thank you for sharing, my entire family loved it! Yay! Thank you for the feedback. I am so happy your family enjoyed this simple and delicious dish. This was delicious and came together so quickly ! Thank you ! We found there was too much ginger for our taste, was perfect otherwise. Thank you for your feedback. So glad you enjoyed this quick and delicious recipe. I love ginger and I can see how in this dish it could be a bit much. Def reduce it next time for your taste. 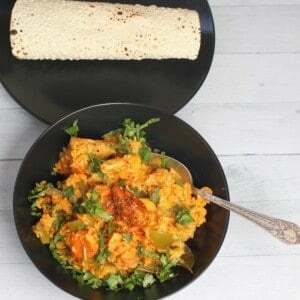 Hi Archana, can I make this without soaking the rice? I come home from work in the evening and have about 40 min only to get dinner on the table. Would I need to increase the cooking time? By the way, all of your photography is beautiful! Hi Palak! Yes it will work without soaking too! Just the rice will not be as separate and long as after soaking! I am in fact going to try it soon too! 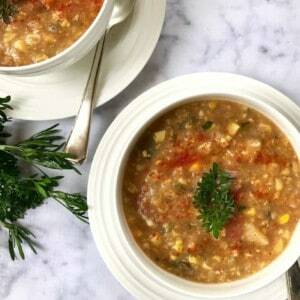 I love cabbage recipes, especially when it’s cold! I’ll be trying this soon with my new instant pot! i made the cabbage rice , and it was awesome. i just followed your recipe and it came out just right . my entire family loved it . Thank you for your lovey feedback. I am so happy that the entire family loved it. I’m making this right now. What kind of green chilies do you use? The little hot Thai ones or one specific to Indian cooking? 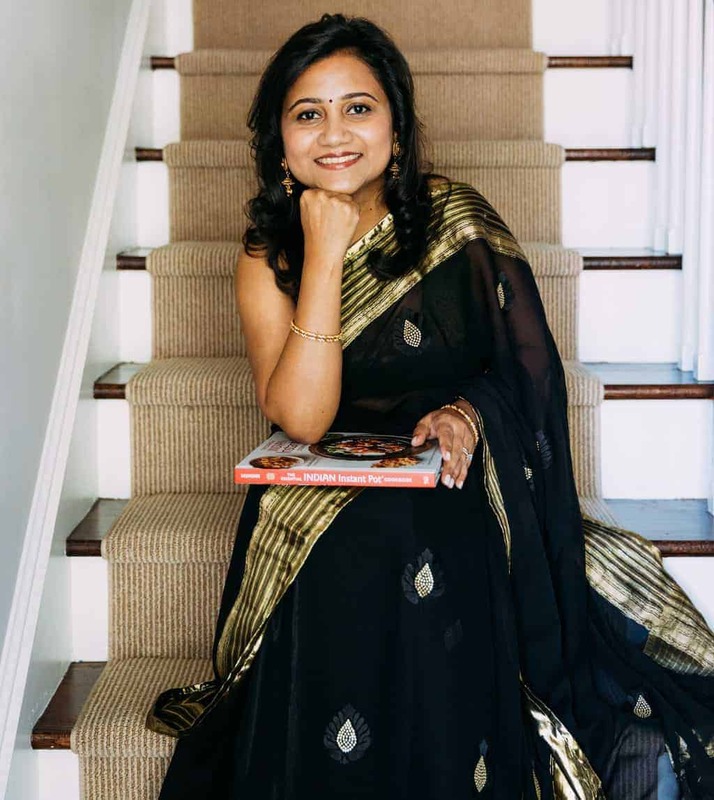 Hi Archana! Can I use pre-prepared minced ginger (the kind you buy in a jar)? This was delicious, even though I couldn’t find curry leaves. 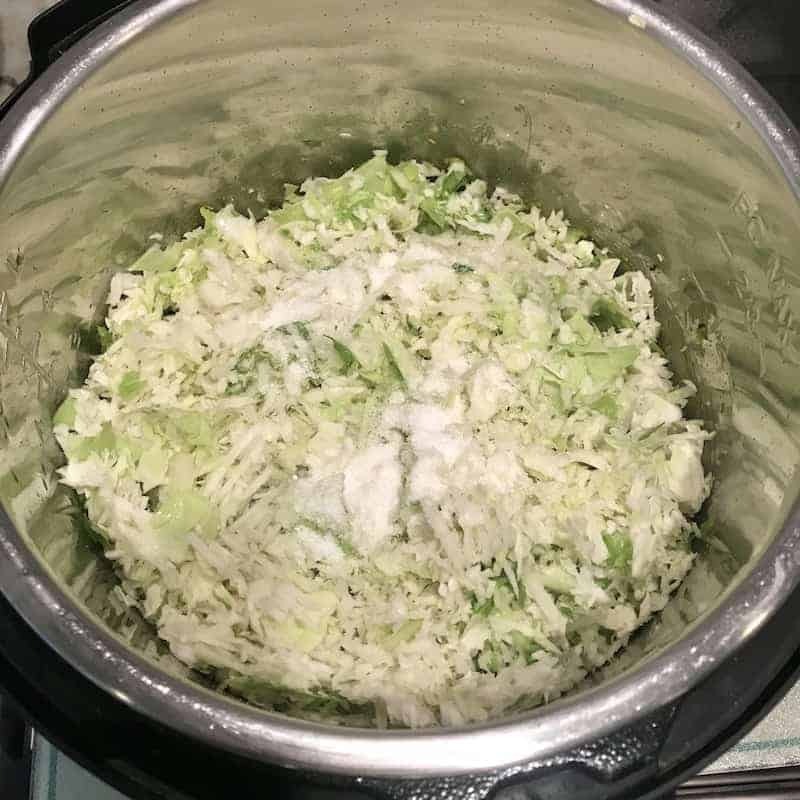 I never liked cooked cabbage much, but I will be making this again for sure. 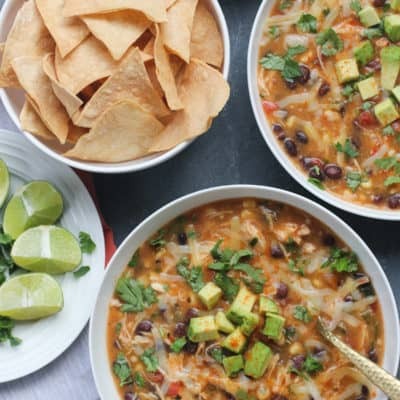 So many instant pot recipes are rich and heavy with lots of meat and cheese and canned soup. I was looking for something else and this feels so healthy! I can’t wait to try some of your biryani recipes. Thank you! I am glad you enjoyed the simple flavors. It is a great way to use up a lot of cabbage. And l look forward to hearing how you like the biryanis. If I cook rice varieties in rice mode the rice is becoming mushy. I tried couple of times. I am using IP ultra 9 in 1. What are the changes I should make to attain seperated grains. Water to rice ratio. Depending on the recipe you are making you will different water ratio. For example for biryani I do 1:1 for plain rice even 1:2 works. Soaking rice also helps. If you follow this recipe exactly it should not come out mushy. Also take the inner pot out and put it on a hot plate so it does not continue to over cook. Thanks for the recipe Archana, I tried it and liked it too. can I substitute qunoa for the rice? 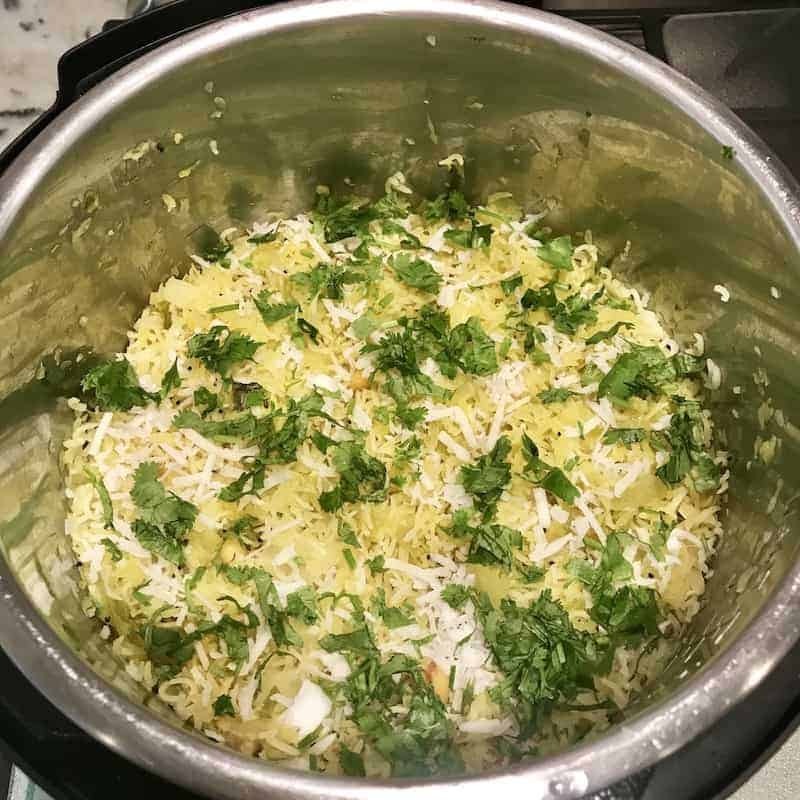 Hi, I have made cabbage rice as per your recipe in the IP and loved it each time. I dont have an IP now and want to know how to make in pressure cooker. How many whistles or minutes should it cook? Hi Radha, So 3 mins of pressure cook time on IP is same as one whistle. So Cook for 3 to 4 whistles. You can also cook it on stovetop if you like. Made this for lunch today. Yummm. We loved it. I am not a fan of cabbage but I was able to finish the whole head of cabbage in one meal. This is a keeper recipe. Thank you for the feedback. I am so glad you enjoyed it.